Developer Dong Nguyen announced via Twitter that the game will be taken off the Apple and Google markets in 22 hours. Flappy Bird creator Dong Nguyen has surprisingly announced via Twitter that his game will be taken offline in just 22 hours. 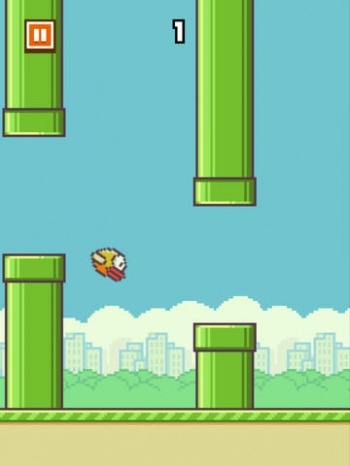 "I am sorry 'Flappy Bird' users," said Nguyen, "I cannot take this anymore." He later added that the reasoning for the takedown is "not anything related to legal issues. I just cannot keep it anymore," and that he will continue to make new games. Flappy Bird is the frustratingly difficult iPhone and Android game that quickly, and unexpectedly, shot to the number 1 spot in both the Apple app store and Google's Play store. However, it faced some pretty harsh criticism from the citizens of the internet, both for being a "terrible game" as well as essentially plagiarizing assets from Nintendo's Super Mario Bros. series. It looks like Nguyen, who reportedly makes up to $50,000 a day from the game, simply can't handle the internet vitriol being slung at him on a daily basis. And hey, who can blame him? Some of the things people say under the protection of internet anonymity can be pretty vile. Nonetheless, it would have to be pretty harsh comments for him to throw away $50,000 a day, and it's possible that there may be some kind of legal action under the surface that Nguyen can't, or won't, talk about. What do you think? Have you played Flappy Bird? Is it just a shameless cash-in of Mario assets thrown around a haphazardly built game, or is it the next Angry Birds?